HASCO is presenting a completely revised hot runner concept for the first time at K2013. 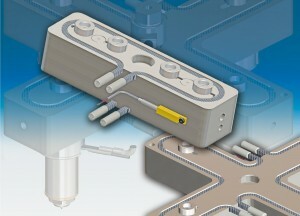 This offers a very wide range of options for the layout of a hot runner system, despite the different, standardised outside dimensions of the manifold blocks. Not only can the hole distances for the nozzles be freely selected within the pre-defined limits – HASCO also tailors the flow channel cross-sections in the manifolds to the application in question. The H4000/… manifold concept is combined with the nozzle series in HASCO’s current nozzle range to provide high-quality hot runner systems that meet the most stringent of requirements for injection moulding production. The HASCO turn plugs that have been successfully used for many years are employed for the melt channel deflections and as plugs on the manifold bars. 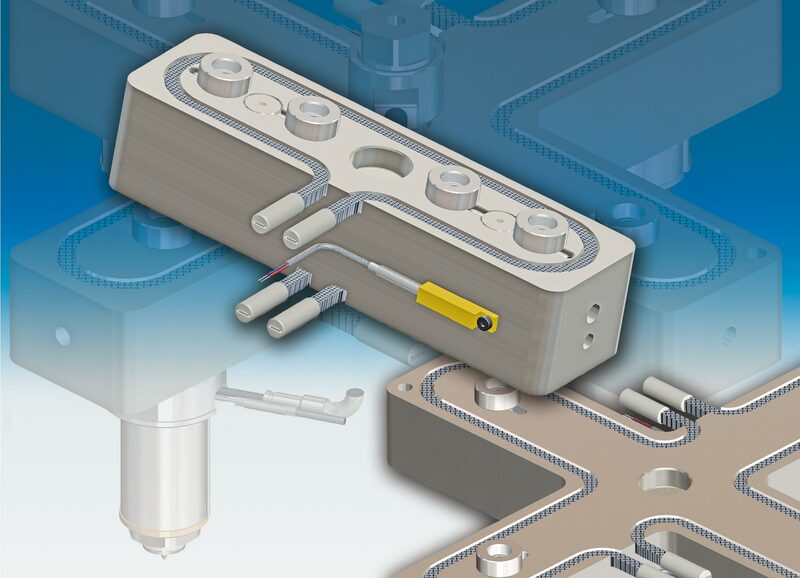 This guarantees a leak-free manifold and optimum passage of the melt through the deflection, while ensuring that the molten polymer is subject to only minimal shear. The H4000/… manifold concept takes in a series of manifold geometries. Simple deflector manifolds are supplied for nozzle spacings from 35 mm to 440 mm. Naturally balanced manifolds for 2 or 4 nozzles arranged in a row can similarly be supplied with a maximum distance of 440 mm between the outside nozzles. The cross-shaped manifolds are designed for a symmetrical nozzle configuration on a square, with a maximum distance of 315 mm possible for the nozzle spacing. Hot runner systems based on the new, standardised manifold concept H4000/… offer an outstanding price to performance ratio. They are also the answer to tightly scheduled mould projects, since they can be supplied within just a few working days. Our specialist advisers and application engineers will be pleased to assist you in selecting the right hot runner system for your application.